Fill out the form below to send a message to Baldwin Pergolas! Baldwin Outdoor Comfort prides itself on providing the highest quality outdoor products. We love it! Your assistance and patience during our installation was greatly appreciated. The construction went flawlessly. Everything fit together perfectly, we didn't have to "tap" one purlin or rafter into place, they just seemed to fit. Thank you for all the help and instruction. We absolutely love, love, love it. It seems to fit perfectly on our patio and I know that we will enjoy it for many years to come. We would do this again in a heartbeat! I'm sending you pictures of the process and the finished product. MAX!!!! You are unfriggin believable!� This thing went together so easy I still can't believe it. Especially when I went to measure down 28 inches on the posts to set the gussets and found that you had already put lines there.....Your attention to detail was great.� This whole thing slid together. I didn't have to touch one piece with anything but my hands. The most labor intensive part was screwing down all the purlins at the end. Matt, I just wanted to let you know how pleased I am with the new pergola. As a woodworker I appreciate the precision and thoroughness of the kit. I installed the cement pads the previous weekend and did the entire remaining installation in about 6 hours the following weekend with one helper. Very nice looking and I know I am going to enjoy the long term benefits of using a fiberglass products. I will send you a photo as soon as I finish the 10' dining table and benches that I am building to complete the pergola/dining area. 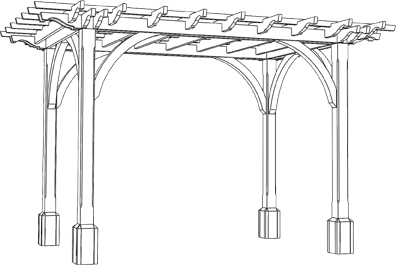 The Baldwin Pergola looked great at the Boston Flower Show- I overheard many wonderful compliments from people in the crowd. I just know that you'll get many orders for it- in red! Thanks for designing such a lovely structure for us. You had asked me to send you some photos and I'm just getting around to it. Installation was smooth and we weren't missing any pieces. Good instructions. We love it. I installed rope lighting and it really pops at night. The pergola looks great, dont you think. I'm really glad everything worked out so well and appreciate that you worked so hard to deliver on time. The system installed well, it took only 7 hours working alone. And, my customer is pleased. Max, I wanted to drop you a line on the pergola. I have received nothing but rave reviews on this "magnificent structure". All of our expectations have been meet and exceeded - your shop has done a great job. We are celebrating an engagement and it will get a lot of usage during that party. Thanks again for your commitment on getting it here as you promised. We will look forward to many years of enjoyment.